Honey, We Shrunk Ourselves is a 1997 direct-to-video third sequel to Honey, I Shrunk the Kids and Honey, I Blew Up the Kid. It is the last installment in the Honey, I Shrunk the Kids trilogy. The directorial debut of cinematographer Dean Cundey and released through Walt Disney Home Video, it tells the story of inventor Wayne Szalinski as he accidentally shrinks himself, his wife, brother, and sister-in-law with his electromagnetic shrink ray. Rick Moranis returns to portray Wayne Szalinski. He is the only returning cast member from the previous films. His wife, Diane, is portrayed by Eve Gordon, and their youngest son, Adam, now a preteen, is played by Bug Hall. Amy and Nick have gone away to college and living their adult lives (as discussed between Diane and Adam in the film). It includes Wayne's extended family, including his brother, Gordon, and sister-in-law, Patti. Unlike the first film, where the kids had to get their parents' attention, it's vice versa. Only a few months after the film was released, the Disney Channel picked up a show based on the Szalinskis' troubles: Honey, I Shrunk the Kids: The TV Show. It starred Peter Scolari as Wayne. This was the last incarnation of the franchise; this is also Disney's first live-action film to get a direct-to-video release. 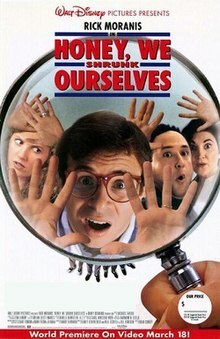 As of 2019, Honey, We Shrunk Ourselves stands as Moranis' most recent live-action film (though he would continue to do voice-acting for the next several years). Eight years after the events of the previous film, ten-year-old Adam just wants to be a normal boy and go to baseball camp. However, his interest in sports seems almost alien to Wayne and Diane, as Amy and Nick, who are currently living away from home, were a thespian and genius, respectively. Wayne has started his own lab, Szalinski Labs, with his brother, Gordon, and they receive tickets to witness a shuttle landing, but Diane interrupts Wayne's message, reminding him that he needs to watch Adam and his cousins, Jenny and Mitch, while she and Patti go on vacation. She also reminds him to get rid of the Tiki Man that she sees as an eyesore, though he considers it a good luck charm (not to mention something that could earn him a fortune one day). After Diane and Patti leave, Wayne and Gordon have activities planned that bore the kids. Wayne sends them to the store, but reveals to Gordon that it is a ruse to get rid of them long enough so that he can use his shrinking machine in order to shrink the Tiki Man without Diane's knowledge, and without the risk of unintentionally shrinking the kids (although the machine now fires at the push of a button instead of at random like before). However, after carelessly not turning it off immediately after they succeed, Wayne and Gordon are shrunk when a billiard ball left on it falls onto the activating button, just as they are in front of it searching for the Tiki Man. Meanwhile, Patti realizes she forgot to leave Mitch's medicine for his potassium deficiency, and they head back. Hoping to catch Wayne and Gordon by surprise, they sneak up to the attic only to be shrunk when another billiard ball falls onto the activating button. Shortly after, the kids return home, and after hearing Wayne's message about the launch, assume they are alone for the evening, and Jenny makes plans to have her friends come over. Upstairs, the adults make use of a fishing rod to lower themselves down into Adam's room. To attempt to get to the floor, they use his Hot Wheels race track, but they overshoot their target and fall down the laundry chute ending up in a clean load that is delivered back upstairs by Adam and Mitch. They tumble out of the laundry basket when it is overturned, and discover Adam and Mitch reading a Sports Illustrated Kids magazine, revealing to Wayne that Adam's interest is not in science as he hoped. Seeing Mitch struggling, Patti realizes that they need to get him his medicine soon, or he could pass out. He ignores his weaknesses, though, and goes downstairs. The adults witness the arrival of Jenny's friends and decide to use a bubble machine in order to get downstairs. Diane and Patti land safely, but Wayne and Gordon fall into a bowl of onion dip and are nearly devoured by the girls. In the kitchen, when Patti and Diane resolve to find a way up the counter in order to find Mitch's medicine and push it into view, they encounter a daddy long-legs with its leg caught in a spider web, and Diane quietly talks to it as Patti tries to cut the web with a nail file. Diane realizes her own insecurities about being small as she relates to it, which she had earlier tried to kill, and realizes how hard it is to be that size. After it's freed, Patti and Diane realize they can cling to its silk as it climbs up onto the counter. Meanwhile, Wayne and Gordon decide to rewire the stereo to work as a microphone, and a group of boys crashes the party, including Jenny's crush, Ricky King. He takes her into the kitchen, where he steals a kiss from her, but she spurns him for not asking permission first, thus earning Patti's respect. Angered, he returns to his friends and they begin to wreak havoc in the living room. Mitch, severely weakened, enters the kitchen and discovers Patti and Diane on the counter before fainting, partially from his failure to take his medicine, and partially from the shock of seeing his miniature mother and aunt. Adam and Jenny discover him, and thinking quickly, Adam gets potassium-rich bananas to give to him, and he begins to recover, weakly saying he had seen his mother. In the living room, Wayne rewires the stereo so that Gordon can talk and amplify his voice so he can pretend to be the voice of God. He orders the guests to leave, leading Adam, Mitch, and Jenny to realize what had happened to them. In the attic, the kids discuss the benefits of leaving their parents shrunk briefly before deciding they love them more than that. They unshrink them. Patti confides her trust in Jenny for how she stood up to Ricky and took care of Mitch, while Wayne tells Adam that he can have an interest in sports, and agrees to sign him up for baseball camp. Diane tells Wayne he can keep the Tiki Man, and won't sweat the "small" stuff anymore, while he decides to relinquish his presidency of Szalinski Labs to Gordon, while he decides to return to inventing. In the end, life is back to normal again, while Wayne has developed a new respect for baseball, and the Tiki Man has been moved into the backyard and enlarged to twice the height of the house. Originally, the film was going to be released in 1996 to theaters. Karey Kirkpatrick was called in to write the script, while working on James and the Giant Peach. The finished script was sent in to Jeffrey Katzenberg, who decided that the studio did not want to continue with the film. It was shelved for a few months while Kirkpatrick resumed work on James and the Giant Peach. While working on it, Kirkpatrick learned that it was going to be picked up again. The Walt Disney Company at the time was having success with releasing direct-to-video sequels, such as The Return of Jafar and Aladdin and the King of Thieves. They wanted to test how live-action sequels would do, so they picked this one to be their first. Nell Scovell and Joel Hodgson were recruited to try to reduce Kirkpatrick's script due to the budget restraint. In Kirkpatrick's script, the group of shrunken parents would originally fall into an aquarium. The scene was cut from the script, and then revised to the bubble machine one. One scene shows one of Wayne's inventions, a machine that translates dog barks to human speech. It is similar to the devices in the "invention exchange" Hodgson did when with Mystery Science Theater 3000. Rick Moranis is the only returning cast member from the original films. He returns to portray inventor Wayne Szalinski, now the head of Szalinski Labs. Marcia Strassman, who portrayed Diane in the first two films and in the 3D film would not reprise her role anymore. Eve Gordon, who was best known as Marilyn Monroe in A Woman Named Jackie, was cast as Diane instead. The onscreen kids, Amy O'Neill and Robert Oliveri, had quit acting by the time the film was released and their characters were only mentioned in a conversation between Diane and Adam. No one replaced them either. Daniel and Joshua Shalikar, who portrayed Adam in Honey, I Blew Up the Kid, had signed on for two additional sequels in 1992. They had reprised their role in Honey, I Shrunk the Audience, but Bug Hall replaced them in the part. Stuart Pankin and Robin Bartlett were cast as Gordon and Patti Szalinski. Allison Mack and Jake Richardson were cast as their kids, Jenny and Mitch. Mack would later become famous as Chloe Sullivan on Smallville. Two of Jenny's friends are portrayed by Mila Kunis and Lisa Wilhoit. Kunis would later portray Jackie Burkhart on That '70s Show, and voice Meg Griffin on Family Guy while Wilhoit would later voice Connie D'Amico on it. The film marked Dean Cundey's directorial debut, replacing Joe Johnston and Randal Kleiser. He is most-known for his cinematography on films such as Jurassic Park, Hook, and some of John Carpenter's early directorial efforts such as Halloween (as well as its first two sequels), The Fog, Big Trouble in Little China, Escape from New York, & The Thing. Originally when the film was going to be released to theaters, the production budget was $40 million. When it was announced that it would be released to home video, the budget was cut down to $7 million. Due to the production cut, the studio decided to use television resolution to save money on effects by not having to pay for a projectable format. Also, the original script included that the party had gotten out of control with around 150 kids, akin to Sixteen Candles or Say Anything. This was considered too costly and it was cut down. Despite the smaller budget, the availability of more advanced SFX technology created a more elaborate effect for the shrinking and enlarging sequences. Designer, Carol Winstead Wood worked on product placement (see below) to increase her budget enabling her to design & build more 'over scale' prop and set elements. The film was digitally composited on three Apple Mac computers, using After Image and Ultimate software, at Cundey's home before it was sent to the Dream Quest effects company for finessing. In just about every scene in the kitchen, the Trix cereal box is turned directly towards the camera. Other product logos shown include Lays, Coke, Diet Coke, Tostitos, Skippy Peanut Butter, Street Sharks, Hot Wheels, Sports Illustrated for Kids, the San Francisco 49ers logo, Sony, Osco Drug, Minute Maid, and Honey Nut Cheerios. All of these products are featured throughout the film, making it one of Disney's few films that encouraged using real-world products and companies. Production Designer of this project, Carol Winstead Wood worked with the show's property master to find companies that would agree to have their products featured. Typically, "as a film designer, we try to avoid having our films look like a commercial however this script was ideally suited for product placement. My original budget was not over two hundred and fifty thousand. These companies helped to increase the Art Department's budget and gave me the opportunity to 'put more production value' on screen. In the film it was challenging to fabricate realistic 'over scale props' that our characters could interact with. Dean Cundey was a great director to work with, his background as a cinematographer paid off handsomely. The integration of the actors working with 'over scale props' into our computer generated backgrounds made this project one of my most interesting films and a privilege to design." The film was released direct-to-video on March 18, 1997. It tied neck-and-neck with the video releases of The Long Kiss Goodnight and The First Wives Club. Unlike the previous films, it received mostly negative reviews from critics. On the film rating website Rotten Tomatoes, the film has an approval rating of 25%, based on 8 reviews. ^ "Laura Dunn". IMDb. Retrieved 2019-03-25. ^ "Honey, We Shrunk Ourselves (1996)". Rotten Tomatoes. Retrieved December 14, 2012.